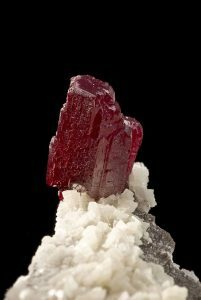 Abellaite and zykaite have special places on the International Mineralogical Association’s official list of minerals. Alphabetically, they are the first and last of the 5,292 recognized mineral species. That number—5,292—was official as of October 2017. But with seven or eight new minerals being approved each month, the list should number about 5,385 now that it's a year later. The practice of naming minerals, past and present, reflects the evolution of mineralogy from its alchemistic beginnings to the advanced science it is today. Over the centuries, the practice of naming minerals has fallen into three general periods: Antiquity, which includes the millennia prior to 1750; Tradition and Science, from 1750 to 1958; and Modern Science, from 1959 to the present. The minerals named during the Antiquity period were common, or at least relatively common, species that were obtained from surface or shallow mineralogical environments. These had distinctive physical properties or important uses that established their identities and were often the origin of their names. As an example, pyrite (iron disulfide) was given the Greek name pyr, or “fire”, alluding to its ability to spark when struck with metal. The origin of the name “gold” is rooted in geolu, the Old English word for “yellow”. Such early mineral names were considered “formalized” if they appeared in scholarly works or simply became popular in general use. Some mineral names evolved through centuries of linguistic transition. The word “silver” originated around 500 as the Lithuanian sildabras became silbar in Old High German, then seolfor in Old English, before emerging in its current form in Middle English, around 1200. During the pre-scientific Antiquity period, knowledge of chemistry and crystallography was rudimentary at best. With little communication taking place among researchers, naming minerals was an imprecise practice plagued with errors, repetitions and confusion. Some mineral names actually referred to varieties, while other minerals had multiple names. And the spellings of these names varied radically among regions and writers. 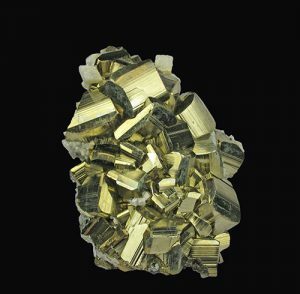 Pyrite’s different crystal habits were once considered separate species, and were named accordingly. And the name “quartz”, derived from the Old High German quarz, was used to refer to silicon dioxide and several other hard, transparent, crystalline minerals entirely unrelated to quartz. By 1750, only about 200 mineral species had been recognized. But the slow rate of new mineral discovery began changing as science replaced alchemy, researchers discovered more chemical elements, and emerging subsciences like analytical chemistry and crystallography provided better ways to identify and classify minerals. These advances ushered in the Tradition and Science period of mineral naming, which as its name implies was a sometimes awkward mix of ancient tradition and cutting-edge science. In 1760, Swedish botanist and geologist Carl von Linne (aka, Carolus Linnaeus, 1707-78), known as the father of modern taxonomy, attempted to organize mineral nomenclature with a binomial (two-name) system of genus and species names, similar to the taxonomic system he had devised for botany. But von Linne’s system was used only briefly. During this time, new minerals were usually named for their chemical compositions, physical properties, or major occurrences. Because most scientists of the time were versed in Latin or classical Greek, or both, mineral names were often rooted these languages. As examples, the reddish minerals rhodochrosite (manganese carbonate) and rhodonite (manganese silicate) were both named from the Greek rhodon, meaning “rose”. In 1789, the first mineral was named for an individual: The name “prehnite” (basic calcium aluminum silicate) honored Hendrick von Prehn, governor of Dutch colony of South Africa, where the new mineral had been found. Naming minerals after individuals quickly gained popularity. Cordierite (magnesium iron aluminum silicate), known for its blue iolite gem variety, was named in 1813 for French mineralogist Louis Cordier (1777-1861), a pioneer in the field of microscopic mineralogy. Many researchers argued against naming new minerals for political figures, suggesting instead that they be named only for scientists. But in 1823, goethite (basic iron oxide) was named for German poet and philosopher Johann Wolfgang von Goethe (1749-1832). Minerals were also named for mythological figures. Aegerine (sodium iron silicate) was named for Ægir, the ancient Norse god of the sea. Later, neptunite (a complex multimetal silicate) was named for Neptune, the Roman god of the sea. Selecting a name for a new mineral was solely up to the discretion of its discoverer. However, by the 1820s, researchers had begun publishing new mineral descriptions for review in scientific journals, and occasionally received naming suggestions from their peers. Researchers also began correcting some of the naming errors made in Antiquity. In 1835, realizing that the name “calamine” referred to two different minerals, they dropped that name entirely and assigned the two minerals their current names: smithsonite (zinc carbonate), after English mineralogists James Smithson (1765-1829), the founding donor of the Smithsonian Institution; and hemimorphite (zinc silicate), from the Greek words hemi, meaning “half”, and morph, or “form”, alluding to its tendency to exhibit different habits at opposite terminations of the same crystal. But while the mineral naming process was slowly becoming a bit more orderly, many researchers still worked independently, unaware of the efforts of their peers. When they identified the same new minerals, they almost always named them differently. In 1837, when 350 minerals had been recognized, American mineralogist James Dwight Dana published his landmark System of Mineralogy, which classified minerals by chemistry and crystallography. Dana initially suggested a binomial naming system, but dropped the idea in later editions. Nevertheless, his System did help to formalize existing mineral names and standardize spellings. In 1875, mineralogists adopted the convention of ending new mineral names in “-ite”, a suffix derived from the Greek lithos, meaning “stone”. This idea caught on, even though it was not new. Some minerals such as hematite (iron oxide) and a few others that had been named in the Antiquity period already had the “-ite” suffix. Mineralogists also began conserving type specimens—the original material from which new minerals had been identified. Conserving type specimens in university and museum repositories made them available for direct comparison with proposed new minerals, and for later study should reevaluation of that mineral’s status become necessary. By 1900, when mineralogists had recognized more than 1,000 minerals, the emergence of atomic theory and the introduction of advanced analytical and X-ray diffraction techniques had greatly accelerated the rate of new mineral discovery. In the 1920s, with new minerals being named faster than ever before, both the Mineralogical Society of America and the British Association for the Advancement of Science recognized the need for a central authority to regulate the naming process. Their proposals, however, found no support. Natural History, published An Index of Mineral Species and Varieties Arranged Chemically. Hey’s Index, as this popular work became known, classified the known minerals into 32 chemical groups. Although Hey’s Index did not propose a standard naming procedure, it did further formalize mineral names. By the late 1950s, scientists had recognized 2,000 mineral species and the process of naming new ones had become chaotic. Of the 583 new minerals described in various journals between 1940 and 1958, 203 were later shown to be either identical to, or varieties of, existing minerals, while 69 others had been recognized from invalid descriptions. Another study found that the 2,000 recognized minerals had 25,000 names that were still in use in various parts of the world. In 1956, the British Mineralogical Society proposed forming an organization of national mineralogical societies to further worldwide cooperation in the mineralogical sciences and to formalize mineral nomenclature. This time the idea gathered support and, in 1958, the mineralogical societies of 16 nations banded together to form the International Mineralogical Association (IMA). The IMA immediately created the Committee on New Minerals and Mineral Names (CNMMN), now the Commission on New Minerals, Nomenclature and Classification (CNMNC). This marked the beginning of the Modern Science period of naming minerals. The committee devised a standard review process to confirm the validity of each proposed new mineral and the already named species that required additional study. It also “grandfathered” 1,289 previously named minerals such as quartz, gold, silver, malachite and galena, which were accepted without undergoing the standard review process. The CNMNC also addressed the problem of minerals with multiple names. An example was calcium titanium oxysilicate, which was known as both “sphene” and “titanite”. Although sphene was the more popular name, the committee went with the name first used—titanite. This CNMNC’s review process for new minerals is used today. When researchers believe they have identified new minerals and can provide supporting chemical and physical data, they submit proposals to the CNMNC, which determines whether the new minerals are valid. Until they are approved (or rejected), the proposed new minerals are identified only by a number. 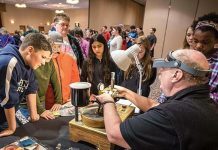 The IMA, which now has 38 national mineralogical society members, urges the discoverers of new minerals not to publish descriptions until the CNMNC has approved the minerals. This eliminates confusion by keeping names out of print until it is certain that they do not duplicate those of previously recognized minerals. When new minerals are approved, the CNMNC considers the names that their discoverers have proposed. The committee specifies that these names end in the “-ite” suffix and are based on chemical composition, physical properties, relationship to other recognized species, type localities, or deserving persons. Regarding the latter, the committee strongly suggests that the names honor individuals with significant achievements in fields related to mineralogy. Nearly half of all mineral names now honor individuals, continuing the trend that began in 1789 when prehnite was named for South African colonial governor Hendrick von Prehn. Most minerals are named for scientists. Among the collectible minerals, these names include adamite (basic zinc arsenate), after French mineral collector Gilbert-Joseph Adam (1795-1881); bornite (copper iron sulfide), after Hungarian mineralogist Ignaz von Born (1742-91); and scheelite (calcium tungstate) after Swedish-born German chemist Carl Wilhelm Scheele (1742-86). Exceptions are the garnet-group mineral uvarovite, which honors Russian statesman Sergey Uvarov (1786-1855), and mozartite (basic calcium manganese silicate), named for Austrian-born German composer Wolfgang Amadeus Mozart (1756-91). Mineral names honoring those who have contributed to mineral education and mineral collecting include bobjonesite (hydrous vanadium oxysulfate), named for Rock & Gem’s senior editor, Bob Jones, and wendwilsonite (hydrous basic calcium magnesium arsenate), which honors Wendell Wilson, editor and publisher of The Mineralogical Record. Only about 80 mineral names honor women. Foremost among these women—as measured by achievements in science—is Polish-born French researcher Marie Sklodowska-Curie (1867-1934), the discoverer of radium, recipient of two Nobel Prizes, and the first woman to ever win a Nobel Prize. Sklodowska-Curie actually has two minerals named for her: sklodowskite (hydrous magnesium uranyl silicate) and curite (hydrous lead uranyl oxide), an honor she shares with her husband, French researcher Pierre Curie (1859-1906). Sklodowska-Curie is one of only 30 individuals who have been honored twice. Another is U.S. astronaut Neil Alden Armstrong (1930-2012), the first person on the moon. The minerals, both identified from lunar specimens, are armstrongite (hydrous calcium zirconium silicate) and armalcolite (magnesium iron titanate). Armalcolite is jointly named for ARMstrong and his Apollo XI crewmembers Edwin E. “Buzz” ALdrin (1930- ) and Michael COLlins (1930- ). Roughly one-quarter of all minerals are named for places, such as nations, regions, towns, mining districts, type localities, and mines. Examples are aragonite (calcium carbonate, orthorhombic), after Aragon, Spain; shattuckite (basic copper silicate), after the Shattuck mine in Bisbee, Arizona; and the gemstone brazilianite (basic sodium aluminum phosphate), after Brazil. Two of the world’s greatest mineral specimen localities are also honored: ojuelaite (hydrous zinc iron arsenate), after Mexico’s historic Ojuela mine; and tsumebite, after Namibia’s famed Tsumeb mine. About 14% of minerals are named for their chemistry. These include stibnite (antimony trisulfide), after stibium, the Greek word for the element antimony; and vanadinite (lead chlorovanadate), after the element vanadium. A dozen mineral names begin with “chalco-”, from the Greek chalkos, meaning “copper”. All contain copper as an essential element, except for chalcophanite (hydrous zinc iron manganese oxide). While it does not contain copper, it does turn a coppery color when heated. Its name stems from the Greek words chalkos and phan?s, the latter meaning “appearing”. About 8% of mineral names are based on physical properties. Among the most familiar are azurite (basic copper carbonate), for its azure color, and the dense mineral barite (barium sulfate), which takes its name from the Greek baryts, for “weight”. Many of the remaining names were assigned in antiquity and include cinnabar (mercury sulfide), from the Arabic zingafr, and galena (lead sulfide), after a Latin term for lead ore. Despite the IMA’s modern nomenclatural system, some confusion remains, particularly regarding varietal names. 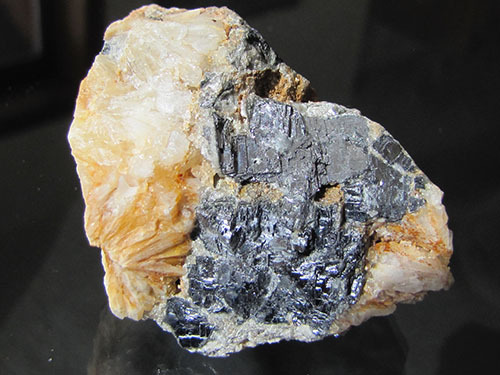 Spodumene (lithium aluminum silicate) was named in 1800 after the Greek spodumenos, meaning “burnt to ashes”, and alluding to the ashy color of a crushed form used in ceramic glazes. Although spodumene is an accepted mineral, its name lacks the “-ite” suffix. Yet, its two gemstone varieties do end in “-ite”: pink kunzite, after America’s first gemologist George Frederick Kunz (1856-1926), and green hiddenite, after American geologist William Earl Hidden (1856-1919). A similar nomenclatural anomaly is selenite, the crystalline variety of gypsum (hydrous calcium sulfate). The variety name ends in “-ite”, but the name of the parent mineral does not. And a few mineral names are somewhat misleading. Magnetite (ferrous-ferric oxide) is not named for its magnetic properties, but for Magnesia, the region in ancient Greece where it was discovered. Not all IMA-approved minerals even meet the technical qualifications of minerals, which are basically solid, crystalline materials with fixed compositions. One is opal, a noncrystalline, amorphous, hydrous silica with a variable composition; another is mercury, which lacks a crystalline structure because it is a liquid at ambient temperatures. Both are listed because they were historically considered to be minerals. Looking back, 200 minerals were named during the 2,000 years of the Antiquity period; 1,800 during the 200 years of the Tradition and Science period; and 3,200 thus far during the current Modern Science (or IMA) period, which spans under 60 years. These numbers reflect the fact that modern mineralogy is a dynamic and rapidly advancing science. And there is still much naming left to be done, for scientists believe that about 1,400 additional mineral species still await discovery. Along with confirming the validity of proposed new minerals and approving their names, the IMA also announces a “Mineral of the Year”, the most interesting or significant of the year’s newly accepted and named minerals. The IMA’s 2016 Mineral of the Year is merelaniite (molybdenum lead vanadium antimony sulfide). 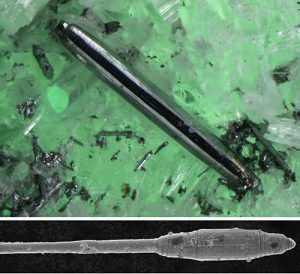 Its black, whiskery crystals, originally mistaken for those of molybdenite (molybdenum disulfide), were found in Tanzania’s Merelani mining area, the source of tanzanite, the deep-blue gem variety of zoisite (basic calcium aluminum oxysilicate). The study of merelaniite will help mineralogists understand the metamorphic origin of the Merelani deposit. The story of how minerals were named is packed with history and lore, and reflects the advancement of mineralogy itself. Alphabetically, this story begins with abellaite and ends with zýkaite. Abellaite (basic sodium lead carbonate) is named for Spanish gemologist and mineral collector Joan Abella i Creus (1968- ), who discovered it in 2016 in an abandoned uranium mine in Spain. 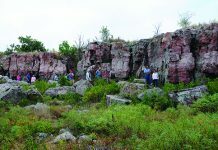 Abellaite was discovered with the assistance of the Carbon Mineral Challenge, an ongoing, cooperative effort among mineralogists to discover new carbon-bearing minerals. Full-page ads for the Carbon Mineral Challenge have appeared recently in Rock & Gem, and explain how mineral collectors and rockhounds can participate (see “Updating the Carbon Mineral Challenge”, Rock & Gem, December 2017). 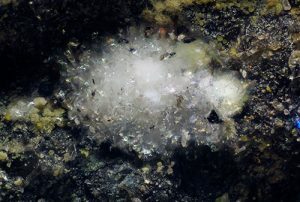 Zýkaite (basic iron arsenosulfate), was discovered in 1978 in the Safary mine in Kank, Czech Republic, and named for Czech geochemist Vaclav Zýka (1926- ), who formerly headed the Czech Institute of Raw Materials. To view the IMA’s master list of all currently recognized minerals, updated monthly, visit www.ima-mineralogy.org and click “List of Minerals”. They’re all there, from abellaite to zýkaite.